"The miso soup portion because I enjoy it and had it Friday before reading the presentation and thought it would be a good astronomy connection." "Comparing the sun to the wings and fire-spitting cobras was cool. I never knew that was a thing. The Egyptians had amazing imaginations! However, I do see why they related the two! Too cool :)"
"The sun's corona; that it was named after the Greek word for 'crown.' It's neat that even though you can't see it during the daytime, you can see parts of it during a total solar eclipse." "The chemistry is interesting to me. I am also taking chemistry this semester, so it's interesting to see the chemistry behind astronomy." "I sort of found the way they explained electrons, absorption, and other things they explained about atoms, as I have always heard it described somewhat differently." "I found the two rules, photon and electron rules, somewhat confusing. Can't really explain why it was confusing, it just was." "Understanding the different energy levels of an electron is a little bit confusing. How exactly do you move an electron from a low energy to a high energy level?" "It is easy to mix up how electrons move between orbitals. "I'm not really confused on anything yet. I do believe I may have a question once we are in class and talking about everything though. Other students usually help spark questions in my head ;)"
"With regards to the blueshift and redshift Doppler effect for light, it is kind of like a car's lights. Blue-ish headlights coming at you (the distance between you and the car is growing shorter), vs the red taillights when it's driving away from you (distance is growing longer) :) That's an easy way to remember it for me!" "Please tell us what miso soup is ;)"
"I like the smell of miso soup, just haven't become a huge fan of the taste of it yet. Plus I am not a huge fan of tofu." "Thanks for reminding us that the sun is not literally a bowl of miso soup, for a second there I started thinking it was." "I love your teaching methods and patience with everyone as a whole, you're a great teacher, very interesting, relatable, and let us understand with light effort." or to two significant figures, the focal length of the objective is +4.5 cm. 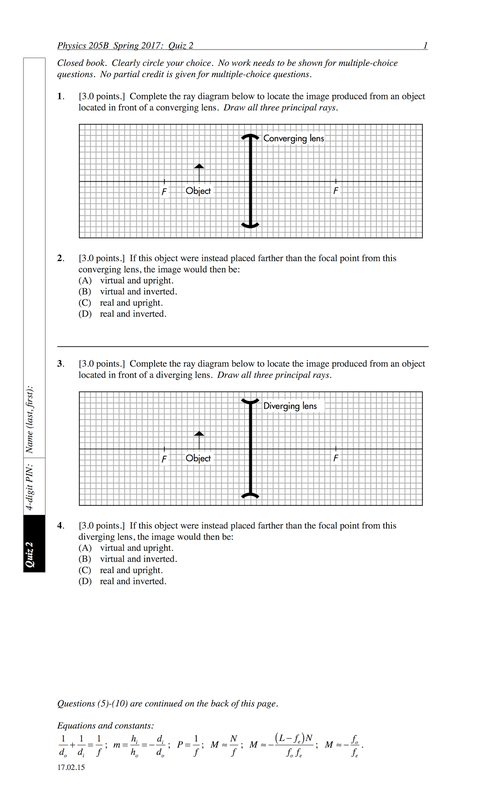 The following questions were asked on reading textbook chapters and previewing presentations on diffraction and charges and materials. "Diffraction is the spread of light from a single slit." "Due to the diffraction minima equation, if there is a smaller slit opening, it would result in an increase of the spread of the diffracted waves and if you make the slit opening larger, it would result in decreasing the spread of the diffracted waves." "Electrons in an insulator are constrained to their atoms, while a conductor has atoms that are more free to move around." "When a neutral insulator (the electrons are pretty fixed in place) is placed near an object that has a charge there is a net attraction depending no matter what the charge is of the object. If a conductor (the electrons are way more free-moving) is placed near a charged object the electrons move away if it is negative or towards the object if it is positively charged." "I don't understand why it is that the smaller slit gets a larger spread or vise versa." 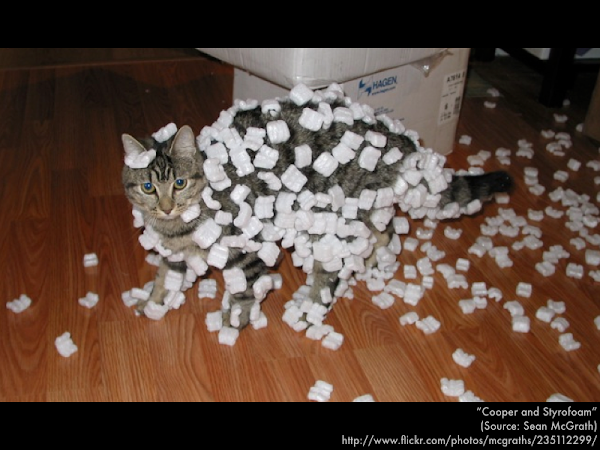 "The mobility of electrons part was a bit confusing for me." "I am having trouble understanding how a neutral insulator or conductor has always has a net attraction towards a charged object, regardless if it is negatively or positively charged. "She became electrically charged after she got in and out of her car. This likely occurred as she adjusted her sweater because her hands were rubbing the electrically neutral fabric." "What kind of sorcery is this?!? But I think she was able to transfer a change in electrons from clothes to spark a fire." "When she is getting out of the car and as she slides across the seat she becomes charged." "The lady became statically charged when she sat in her car. She could have de-charged by touching something metal to ground herself." "Very cool to see different types of everyday things that people use or do and see physics out of it!" "Practicing diffraction minima examples would be helpful." (B) a young gas-giant planet. (C) rapidly moving gaseous debris. (A) Apollo mission astronauts in 1970. (B) the Chinese moon rover Yutu. Our Milky Way galaxy's farthest known stars may have been ripped from the neighboring Sagittarius dwarf galaxy, based on matching the stars' __________ with computer simulations. "I know the difference between maxima and minima." "That the path length difference relation tells us where the maxima or minima will be." "With the double-slit interference, the source phase differences don't matter, but that just their path differences do, we are wanting to know how much longer the wave from one source travels than the wave from the other source. I also understood that in a double-slit interference condition the constructive is maxima, and a condition that is destructive is minima." 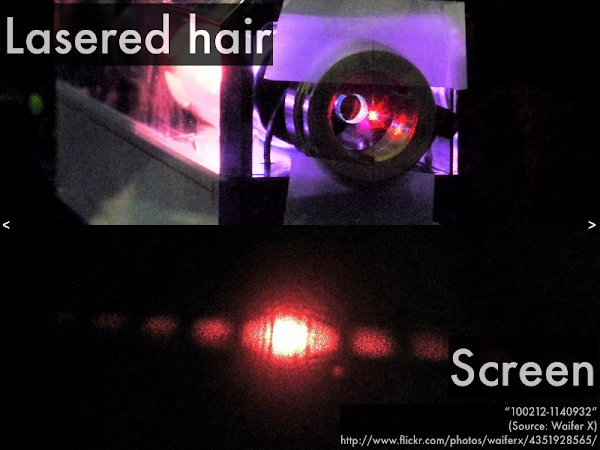 "Double slit interference is two side-by-side in-phase sources. Phase differences don't matter with this and only the path matters. When calculating this we locate where these two sources interfere constructive (maxima) or destructively (minima)." "A really small difference in distances can put waves in interference with each other; it is interesting how much of a difference it can be." "I am not understanding the flow chart for the constructive and destructive conditions. How am I able to tell which pathway I am to choose for the condition I am given?" 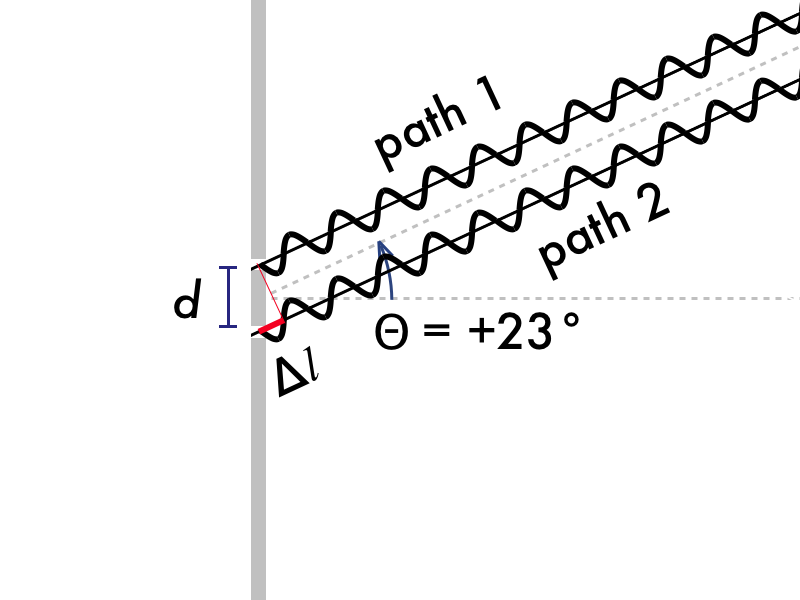 "How to figure out the difference between the minima and maxima for double-slit interference." 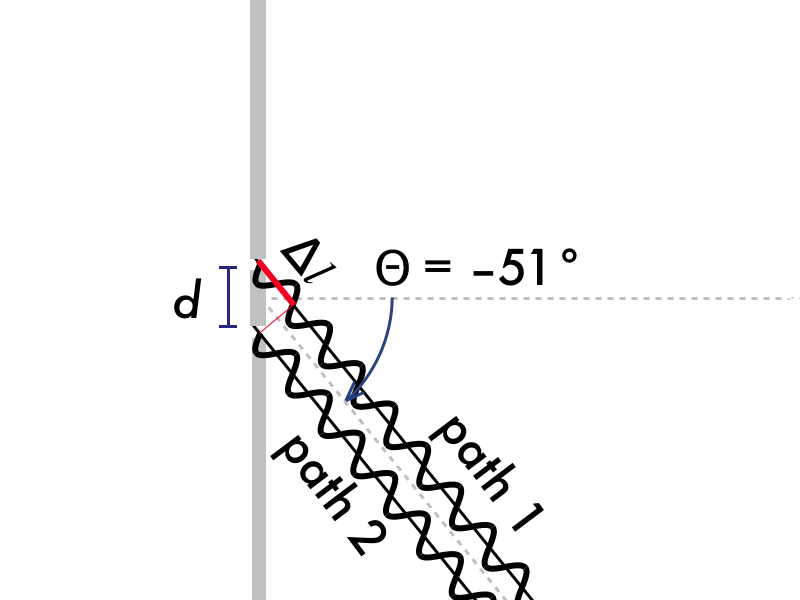 "Path length differences. I'm just not fully understanding on how to find it." "I don't really understand what double-slit interference is." 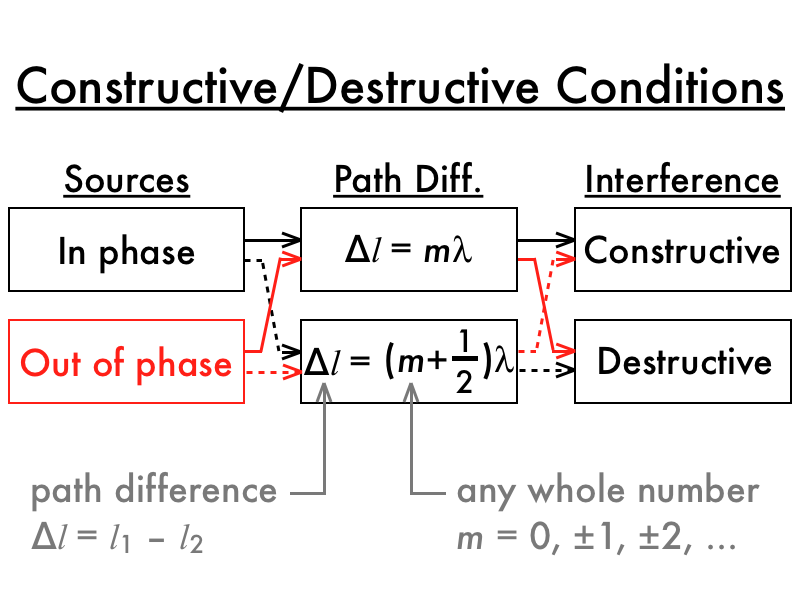 "Constructive interference is maxima and minima is destructive interference." 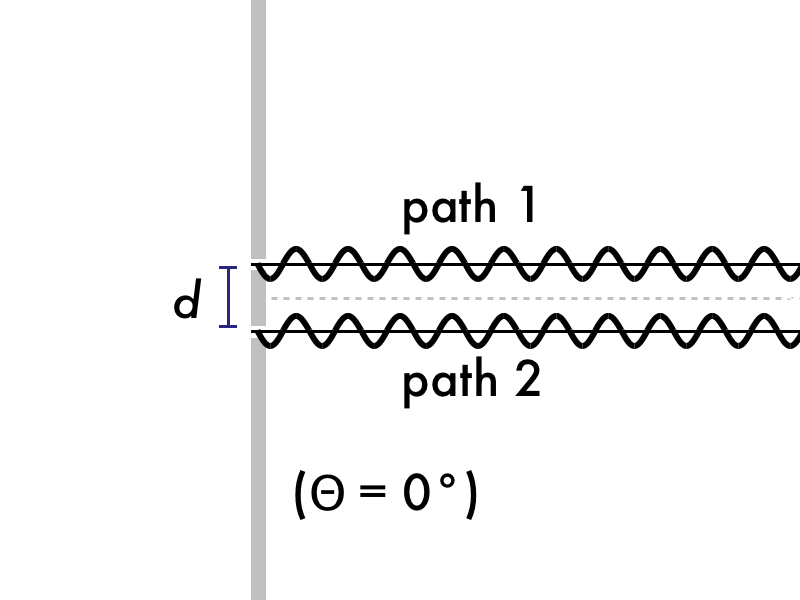 "The difference between the two is that the maxima is when there is a constructive interference or when the path difference is a multiple of the wavelength. A minima happens when there is a destructive interference or when the path difference is either an odd number of half wavelengths." "I'm trying to understand it." "Maxima and minima is the minimum and maximum of wavelength?" "Can we discuss the difference between maxima and minima in double-slit interference? "Petition for more long weekends!" "I found the greenhouse factors unique to each planet was particularly interesting and I was able to read and see how each planet was affected by its conditions and atmosphere." "The 'frustrated volcanos' on Venus were interesting because The Simpsons GIF animation really made it make a lot of sense." "Venus may have had a lot of water but due to the greenhouse affect the water turned into vapor and now the planet's greenhouse effect gets worse with time, and I find that fascinating because it proves the possible extreme result of Earth's global warming and human activity in the worsening of our greenhouse effect." "That Venus and Mars are considered 'runaway' planets because of the fact that they have lost their greenhouse gas cycles...which kinda worries me because what if earth also starts to do the same?" "That how much mass a planet has contributes to the amount of greenhouse gases it lets out into the atmosphere. Also, how the distance from the sun to the planet determines how much warming there will be from the greenhouse effect." "The dwarf planets!!!! I had no clue there were other dwarf planets than pluto! Wicked. Haumea is the most interesting to me by far, it's interesting that they classify it "round enough" to be a dwarf planet." "It is good to finally know why Pluto is no longer considered a planet. Before, I just accepted that fact without giving it too much thought." "I am confused how both Venus and Mars can have volcanos without plate tectonics." "Why is Venus so much hotter than Mars since their masses aren't vastly different, and orbits aren't that significantly different?" "The whole greenhouse things and how they relate to different planets, if you could please go into detail that would be great." "Greenhouse effect factors are still pretty confusing for me. I've been trying to read up on it more, but I think I just need a simpler way of understanding it! The more I read about it, the more confused I get." "Uranus--is the axis really that drastically tilted, and could you explain again the impact this has on making it cooler than Neptune?" "I found Kuiper belt a bit confusing. What exactly is the belt and why are the objects, such as Pluto, located on that belt not considered planets." 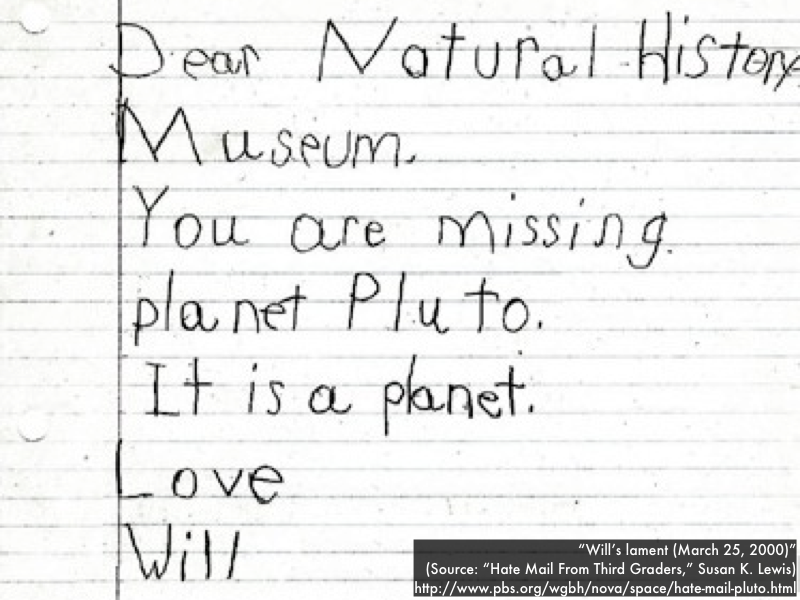 "More about Pluto and why it's no longer a planet." "Pluto is considered a dwarf planet, along with four others along the Kuiper belt. Pluto was once considered a planet. For the sake of argument, if Pluto was a planet, then the other four should be as well, as they are all on the Kuiper belt. But just because they are all on there doesn't mean they should all be planets." "If Pluto no longer fulfils the requirements of planethood, then I have no problem with it not being a planet." "Because it is itsy-bitsy, and scientists say so." "It's not up to me if it is a planet or not." "I'm fairly neutral on the topic. I feel if they outline a criteria for what defines a planet then they need to hold consistent with that criteria and no exceptions should be made. If Pluto is granted an exceptions then what is stopping people from defining some of the other dwarf planets as actual planets?" "I believe if something has moons, it should be considered a planet." "I grew up with Pluto being a planet, plus I liked Pluto the Dog from Disney movies." "You can't give a present and take it back without being rude. Can't give it planethood and take it back without being rude either." "Pluto is like the main character in My Big Fat Greek Wedding that couldn't sit with the cool crowd because her lunch wasn't in a brown paper bag. "That Venus's crust is so flexible it is unable to break into moving plates." "The different weather on each of the planets is so unique and it would be interesting to see in person." "The different atmospheres of the planets. It is really cool to hear how the atmospheres differ and why they are different." "That low mass planets lose heat faster--I thought the small space would be able to retain heat easier." "I think its interesting that Neptune is blue because the methane! I also think its cool that an astronaut could 'swim' through Saturn's rings. I also didn't know Mars was red because of rust!" "Sunlight helps give the gas giants their bold colors. Well Jupiter, that's why it's so much brighter and colorful than Saturn." "The categorization scheme on what defines a planet--I was wondering how you categorize a moon being a moon and a planet being a planet. 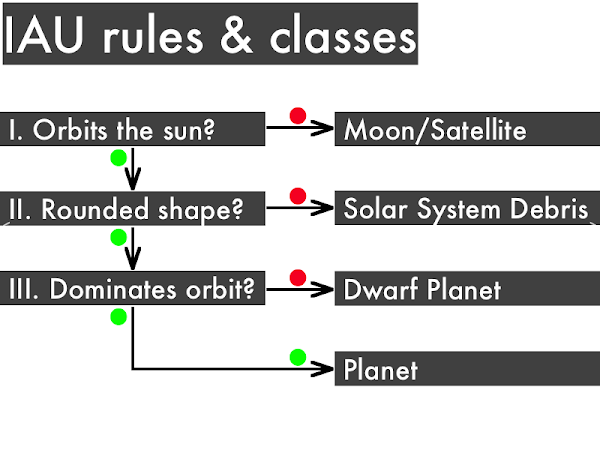 And now there is a new classification called dwarf planets and that's what Pluto is now considered. I wondered about that since it is no longer considered a planet. That Pluto is no longer a planet and now I know why and I agree that it shouldn't be. As we gain new knowledge some old truths get ruled out with new data. That's what science is about." 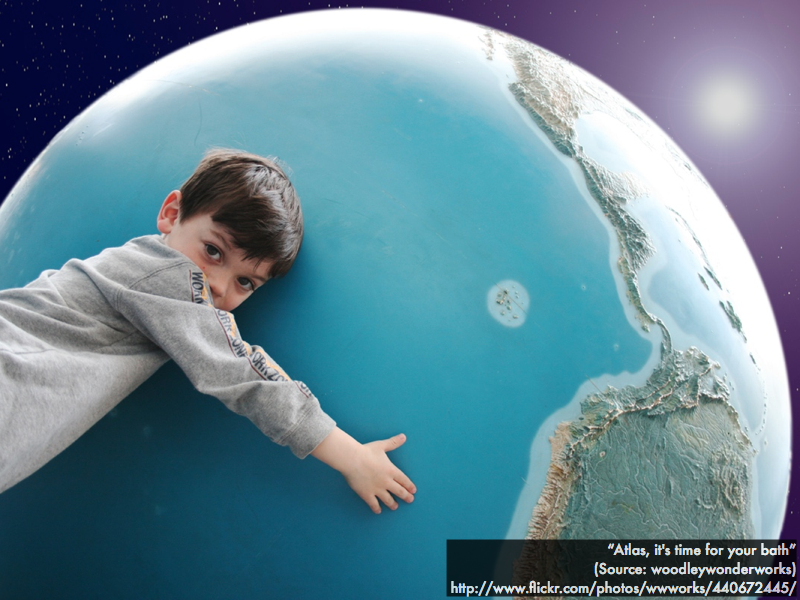 "I think all the information about the planets and comparing them to Earth. Like Venus and Mars compared to Earth. I'd like a little more of a basic breakdown of the comparisons." "The planetary greenhouse effect factors: mass, distance, temperatures and all that--maybe a little more reading and practice will help; I'm just a little confused right now." "The comparisons between Venus and Mars to Earth. I was mostly looking at the mass of the planets to gauge the differences." "How Pluto isn't a planet." "I believe that anything that consistently orbits around the sun should be considered a planet. Plus, it's my favorite planet. 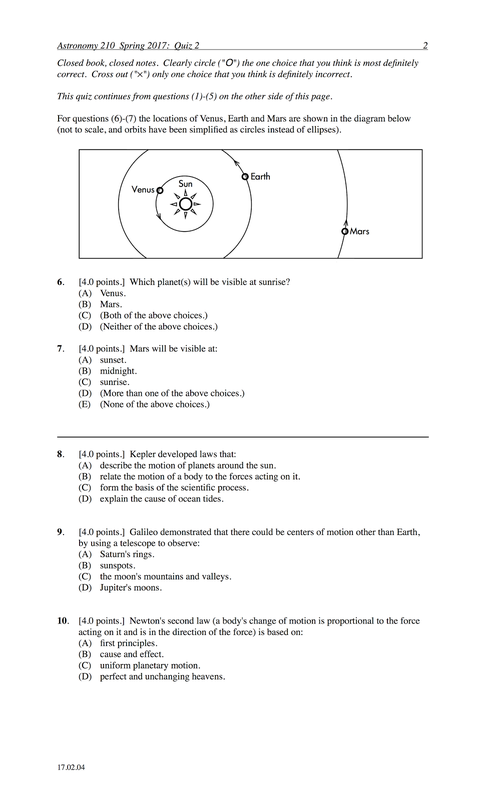 And I found that Earth is hit with asteroids and debris just as often as Pluto, therefor that is not enough of a reason to classify it as a non-planet (learningmind.com)." "It used to be one so it should still be one." "I don't really have an opinion. I mean, I kind of wish Pluto was still a planet. I mean, its kind of not fair to classify it as a planet and then take it away. But, I don't really have more of an opinion than that." "Ohana means family! Family means no one gets left behind! jk :)"
"Pluto was a planet to me until it wasn't. It's awkward now that its not. I feel like he's lonely. I guess I feel neutral about it." "Pluto shares orbital space with lots of other object out in the Kuiper belt, being very icy and super-small. Pluto does not dominate the neighborhood around its orbit." "The way you relate facts to things we can see in everyday life is so helpful! The gravy skin and tectonic plates... :D I will never forget that analogy!" (C) the moon's negative shadow. Astronomy quiz question: planet(s) visible at sunset? Tthe locations of Venus, Earth and Mars are shown in the diagram below (not to scale, and orbits have been simplified as circles instead of ellipses). Which planet(s) will be visible at sunrise? If a line is drawn from Earth to the sun, the observer at sunset (6 PM) is located perpendicular to that line. Since Venus is below that horizon line, it would not be visible at that time; while Mars is above that horizon line, it would be visible high over the east horizon at that time. Astronomy quiz question: planet(s) visible at sunrise? The locations of Venus, Earth and Mars are shown in the diagram below (not to scale, and orbits have been simplified as circles instead of ellipses). If a line is drawn from Earth to the sun, the observer at sunrise (6 AM) is located perpendicular to that line. Since Mars is below that horizon line, it would not be visible at that time; while Venus is above that horizon line, it would be visible low over the east horizon at that time. 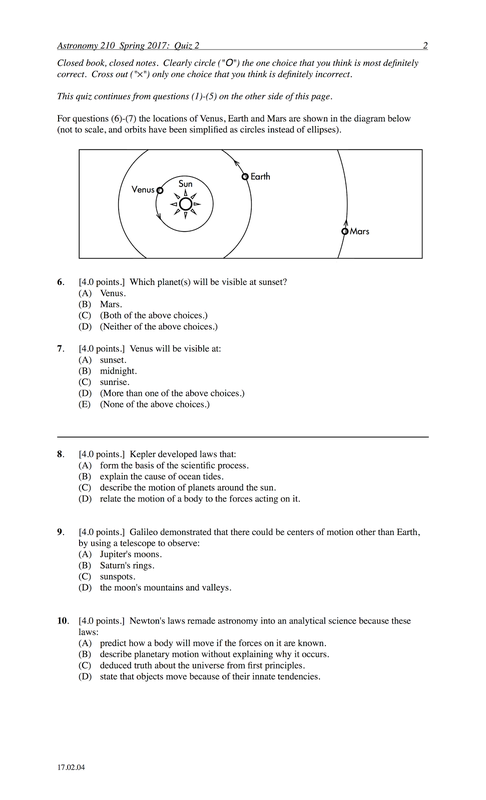 The following questions were asked on reading textbook chapters and previewing presentations on problems caused by the atmosphere for telescope observing, Earth, and the impacted worlds: the moon, and Mercury. "The practice of 'sidereal tracking' to keep telescopes pointed towards whichever celestial object as the Earth turns on its axis. The calculations and equipment to constantly keep up with the tiny adjustments have to be very accurate and precise which is incredible." "I found the enormous telescopes built on mountain tops to be the most interesting. I know how much energy goes into residential and commercial projects in cities. Projects of such scale, with totally custom materials and equipment, in locations so secluded are extraordinarily impressive." "Our atmosphere blocks out most electromagnetic radiation, allowing the things below it, such as us humans, to not be harmed by gamma rays, x-rays, and some radio waves. This is personally interesting because I find it fascinating how much nature naturally helps us out." "I found atmospheric turbulence to be very interesting. I never realized there was such a thing. I especially liked the comparison of looking at an image from under water and the distortion if there is movement in the water. Fascinating that clarity in our sky is effected much in the same manner through atmospherical turbulence." "I found it interesting that volcanoes over time and still today have contributed a massive amount of our greenhouse gases present today." "I loved your analogy of gravy for plate tectonics. It was pretty funny but the way you described it made a lot of sense and actually helped me out. And you're right, heating up gravy in the microwave is just wrong!" "I think it's so cool that at one point long ago there might have been an ocean on Mars. I mean, it's crazy how over time a planet can lose so much of its internal heat that it changes so drastically! Imagine if at one point there was life on Mars and things were swimming in the ocean--the idea of life outside of Earth is so fascinating." "Studying the planet Mercury, I honestly had no clue what this planet looked like and how similar it looks to the moon!" "I found Mercury to be very interesting considering it being a 'one-plate' planet. Knowing how earth was formed with plate tectonics, you might assume that other terrestrial planets might be similar, but Mercury is considered the "one-plate" planet. I found it interesting how Mercury actually has a bigger core than Earth, but looks very similar to our moon, and yet our moon has a smaller core than Earth." "I found the large-impact hypothesis to be very interesting and a unique way to look at how the Earth and the moon could have possibly formed together at the same time." "The concept of adaptive optics was kind of confusing. First off, why is the it necessary to have the technique of adaptive optics and what is the process that achieves that." "Using two separate telescopes to get a more powerful resolution by them working together." "I don't understand how airborne telescopes are practical. Wouldn't it be very expensive to merely stabilize it, as to not blur everything?" "The histories of the moon and Mercury." "This section was the most confusing for me so far. The plate tectonics, greenhouse gases and geological activity were tricky. The only background I have with learning about these things is what I learned in elementary school, so I feel a bit lost. After reading through it a few times, it seems to be clicking more--but I still feel a bit rusty." A large modern optical telescope in outer space would have images with better __________ than a comparable ground-based telescope. "With changes in movement and constant turbulence of the atmosphere, our view of the stars are distorted causing a 'twinkling' stars." "I have no idea... This is what I am confused about." "The force of gravity from other celestial objects?" Identify how carbon dioxide enters and how it is taken out of Earth's atmosphere. Identify the oldest (longest ago) to the youngest (most recent) features on the moon. Identify the oldest (longest ago) to the youngest (most recent) features on Mercury. "Something interesting form the slide was the way the twinkled stars actually look. This seemed interesting because I've never actually looked up how a star looked like before this class." Why stars twinkle. I found it interesting because of how all the air that it goes through, it distorts it and our eyes see the 'twinkle' effect." "I really liked the analogy that compared turbulence distorting the astronomical views to being underwater and having the ripples disrupt your view of the surface. It's a really interesting concept, and the analogy made it easy to understand." "The visible light spectrum is interesting to me, its crazy to think there are colors on the electromagnetic spectrum we as humans cannot see." "The fact that the stars 'twinkle' because of the atmosphere, I always thought it was the stars actually twinkling. Like how our sun flares, I thought maybe other stars flared as well." "I was interested to learn that the ocean plays a role in removing carbon dioxide from our atmosphere. I thought plants were the main filter." "I found it interesting that the moon and mercury are similar with their craters and being mostly airless. I found it extremely interesting that neither of them have an atmosphere therefore unable to inhabit life." "The section about the different telescopes was confusing, I hope we won't be tested on them and what they do!" "I could not find where in the textbook it talked about oldest and youngest features on the moon." "For some reason, I can't seem to grasp the concepts of the features on the moon and Mercury. The terminology is different in the questions and the readings, and I am finding it difficult to establish a timeline for the formation of the features." "the atmosphere is disrupted as we look up at the stars and we are at the bottom so is easier for things to get distorted. The twinkles are from our atmosphere not being calm." "When the light from the stars comes through the atmosphere, different temperatures, densities and winds make it look like they twinkle." "The turbulence of the atmosphere." "How does visible light pass through glass to heat up objects such as plants, but the infrared light that comes from the plant doesn't escape the glass? Is the plant producing the infrared?" (Everything that is warmed-up will have an infrared glow, (unless it's super-hot like a light bulb or the sun, then it will emit visible light, or smoking-hot like an emitting ultraviolet or x-ray light. It turns out that the atoms in glass don't absorb visible light (letting it pass through), but absorbs and re-emits infrared light (blocking it). Interestingly the atoms in a plastic garbage bag will absorb and re-emit visible light (blocking it), but doesn't absorb infrared light (letting it pass through!)). "Do we have to do group work every class? Or could solo work at least be an option?" "I am confused about how to identify the oldest to youngest features on the moon. What do these features look like and how do I categorize them? The material in the book was slightly confusing. Also there was a lot of information in the slides and in Chapters 4 and 6! I will definitely need to catch up on some more reading..."